Posted on original blog May 5, 2009. Living Biology is something we get to experience here on our farm. Over the past few years, I've been sharing many of these experiences as they have come along. My children have been raised with many pets so I'd like to share with you our newest bebies born just this morning. First, here is the story of how these new precious babies came about. Hobbs the daddy, was born born here on May 30, 2007. 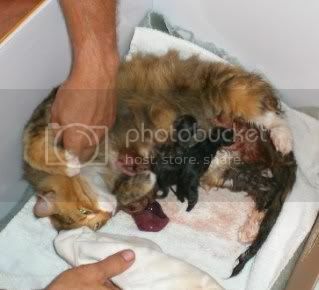 You can read his birth story at Lamaze for cats? He and his siblings baby pictures are posted at Introducing Five Little Kittens. All of the kittens and momma were fixed except for Hobbs. We kept him intact as he was such a beautiful cat, with a loving personality, which we thought would be excellent in future generations. Then along came Suvy and Stickers who were rescued on June 11, 2008. To this day, Stickers, still earns that name. She's sweet and loving but she just can't grasp the concept that her claws need to be in. Stickers was also a bit of a surprise. Early in her life, she needed an emergency trip to the twenty-four hour vet clinic. Her life was saved but the vet insisted that she was a he. Since that left Suvy as the only unfixed female, we didn't give it another thought. We were going to breed Hobbs and Suvy and see what type of kittens they'd throw. You can read Suvy's and Sticker's story at How Many Kittens? Well, sometimes it's best to trust yourself when sexing kittens. Both Suvy and Stickers are females. 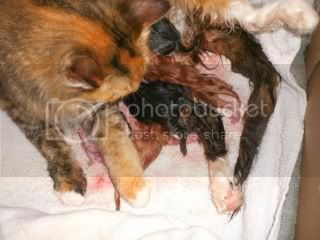 Early this morning, Suvy gave birth to four beautiful kittens. Stickers should be having her's soon. Both mommas are being kept safe inside away from all the other pets. Poor Suvy was very confused this morning about what those wet noisey creatures were. My spouse soothed her and got her to lie down and I went and gathered her babies, dried them off a bit, then handed them to James. He rubbed them on Suvy's face and placed them on her belly. Poor Suvy was so very confused. She wasn't taking to motherhood very well and it was beginning to look like it wasn't going to go well. James encouraged her to lick her babies and I'm happy to report nature has taken over and even the smallest is now nursing! National Geographic has an excellent series called In the Womb for any one who would like to learn more about cats and their development. I'll post babies pictures once they get a little bit bigger.